No singer, not even Andy Bey, or his brother Freddy sang with the kind of molten fire as Nat King Cole. 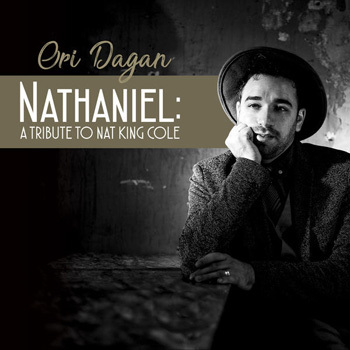 And Ori Dagan, on his tribute to the inimitable vocalist rightly makes no attempt to pour on the liquid velvet on Nathaniel. But what Mr. Dagan does with his singularly delicious baritone is something truly remarkable. Moreover, in switching things up on some of Nat King Cole’s most recognizable pieces, such as “Nature Boy” and “Unforgettable” makes it clear that what he has set out to do on this album is to present his own extraordinary vocal talent at the altar of originality in all his unique style and whimsy, and posh personality as a truly individual and authentic homage to one of the greatest vocalists and musicians in Jazz. To that end Mr. Dagan has also surrounded himself with some of Canada’s finest musicians. For this he has producers Douglas Romanow and a gentleman who is better known as a guitarist, Nathan Hiltz, who also plays marvelously throughout the recording, bringing vivid tone-textures to the classic “Darling Je Vous Aime Beaucoup”. Naturally one finds oneself gravitating to the guests, especially when they are famous and make their presence felt in such a luminous manner. The great Sheila Jordan is heard in all her glory in a gloriously puckish duet with Mr. Dagan on a chart known only too well by her: “Straighten Up and Fly Right”. Alex Pangman is exquisite in her seductive turn “Pretend”. Jane Bunnett brings superb contours, tones and shiftings of sound to “Keep It Simple”, “Complexion” and “El Bodeguero” as does Miss Bunnett’s close associate from the famous Afro-Cuban all-women ensemble, Magdelys Savigne also on “Keep It Simple and “El Bodeguero”. But to forget how extraordinarily bracing, edgy and wonderful Mark Kieswetter on piano and Ross MacIntyre are on bass would be a travesty. Ensuring just how important their contributions are is left in no doubt as the album comes to a close with performances that are as invigorating as a shower of ice-cold water on “Unforgettable”. And with the energy and vitality of that performance Ori Dagan shifts gears from acoustically aerodynamic figures and patterns with which he has glides along on what came before to a memorably inventive performance, through rapid changes in harmonics as he imaginatively exploits the quartet’s full range, drawing on harmonics, and scatting with monumental skill. For all this and a superb recording to boot, bravo all round.